Weekly Update 2017-48: Music from the Cuphead soundtrack, how designers relate to anthropologists, and the amazing miniature cut paper worlds of Mar Cerdà. Once in a while, I come across a game soundtrack that is so good, it could stand on its own without playing the game. And though I have yet to play this wonderful 1930's inspired run and gun action game, I am already enamoured with its soundtrack. This week I compiled a brief of sorts for the next phase of the FriendCanoe project - emails! There will be a number of communications that we will need to include in the experience, from Reset Your Password to It's time to hang out with your friend. Check out the brief here. Now that the content of the emails has been solidified to some extent, I'll be designing the emails this week. I really need to make a big shoutout to Mailchimp, considering I know firsthand the headache of creating HTML email templates that work seamlessly across all the different platforms and devices (I'm looking at you, Outlook). So instead of all that mess, I'll be using Mailchimp templates and testing tools so as not to reinvent the email wheel. Who would ever want to do that? Reflecting on the past while in my role as a UX designer, I have been thinking about the parts of the job that relate best to my interests and personality. I have noticed lately that I really enjoy learning about cultures and the nature behind why people do the things they do. Understanding motivations allows designers the power to reshape experiences that are catered to those motivations, so that users can achieve their goals more easily. In the coming months, I'd like to focus on my design practice as seen through a sort of anthropological lens, to try to tap into that obsession and make it into something useful. And this doesn't only apply to the way users use products that I might be redesigning, but also to daily processes within and without my workplace. Our design processes at ecentricarts are somewhat established but could certainly use a focused look to see if we are solving problems in the most efficient way. 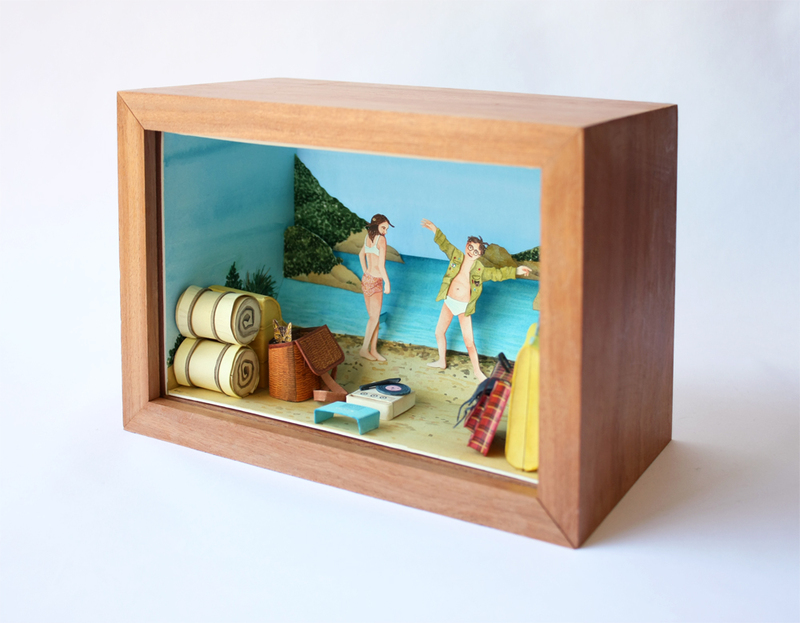 In continuation from last week's inspirational movie prop designer Annie Atkins (specializing in Wes Anderson movies), I now present to you an artist who has mastered the world of cut paper and watercolour miniature scenes (many of which also for Wes Anderson movies). Mar Cerdà is an illustrator based in Barcelona, Spain, using watercolor painting and paper as the base materials of her work. 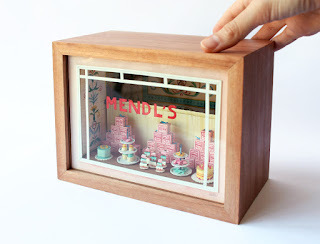 She uses both in watercolor prints and in little dioramas made of cut papers. 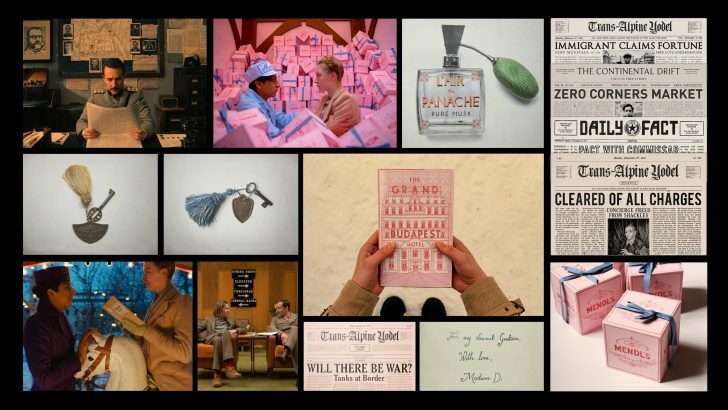 From The Grand Budapest Hotel. What's really interesting is her background in cinema and audiovisual, which have emphasized her fascination with scenography and the treatment of space. She firmly believes that a character can be defined by a space, even if the character is not present at all. I have always been enamoured by dioramas and miniature scenes; playing with scale just tickles me in the right way. Check out more on Mar's website and Instagram. Weekly Update 2017-47: Yeasayer lays down harmonies so smooth they could butter your toast. Alongside that, the frustration of emojis rendering differently on someone else's phone and the people who design elaborate movie props. I believe I first heard of this band by way of The Wedge, a now-defunct alternative programming music show on MuchMusic. 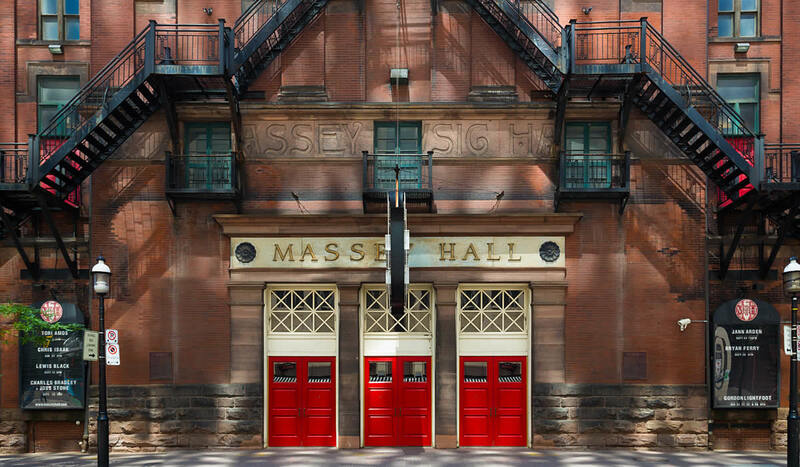 They're an experimental rock band from Brooklyn, and the two lead singers Chris Keating and Anand Wilder really know how to pair some strange rhythms with their equally strange vocal qualities. Along with their third member Ira Wolf Tuton, the band produces their songs all together, a somewhat unorthodox take on composing. The band describes their own sound as “Middle Eastern-psych-snap-gospel,” if that helps at all. Better to just listen and see what you think. They've released four studio albums since entering the limelight in 2006, and (no surprise) their live album from Brussels in 2013 compromises some of their amazing earlier songs along with great banter and stage presence (even if only for the ears). 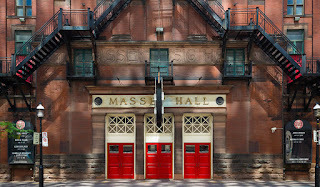 Check out Tightrope and Ambling Alp (my faves), and Red Cave specifically to hear some lovely harmonies. I locked myself in a room at the library yesterday to work on the CSS for FriendCanoe. You can check out my progress here (don't judge me on my disorganized code writing skills, please)! I also attended two client meetings through work last week (both of which required me to present something) and I think they both went quite well. There will be many more opportunities over the next few weeks to keep practicing, since the end of our engagement with this client is far from over, so I hope to continue improving these skills. I also led my drumming band (for the first time ever) in the Newmarket Santa Claus Parade. It was so nerve-wracking! But everything went smoothly (even though it rained quite a bit). I'm waiting on my friend to send me some videos he took of us performing, it seemed like the crowd really liked us! Don't use thumbs up because it's confusing! (This was me trying to use positive reinforcement and just confusing people because the thumbs-up hand signal is used for a break). This week I'd like to keep working on FriendCanoe and thinking of ways to improve the UX. I'll be consulting the Trello board to see what needs tackling next. Being someone who doesn't use a ton of emojis in their daily communication, I often wonder about the social behaviours associated with people who use them more frequently, and in different ways. 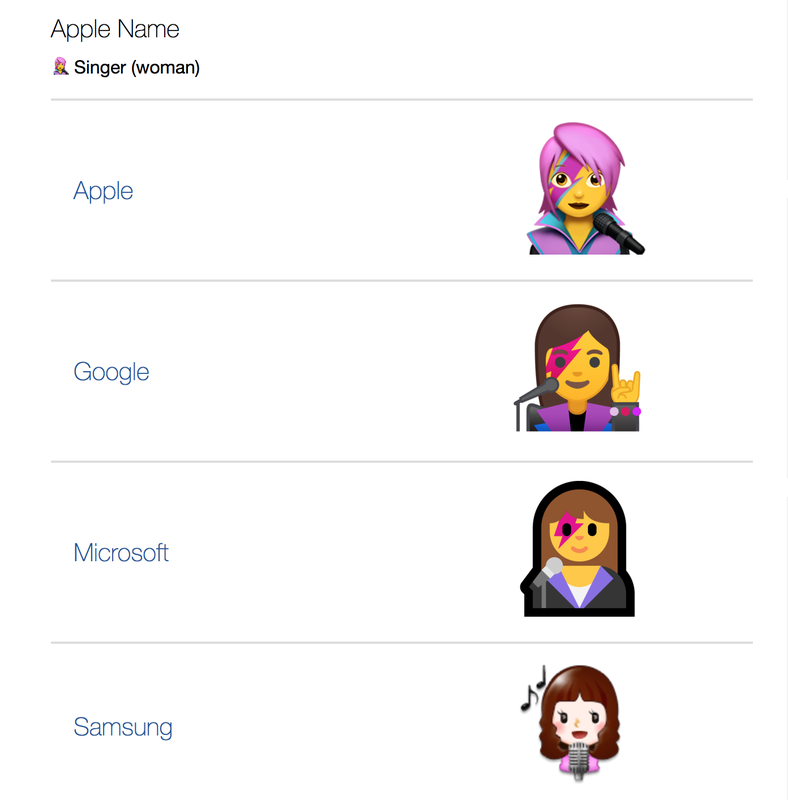 Depending on the make and model of your phone, the emoji I send to you may look completely different, or not be present at all and render as a blank square □ . 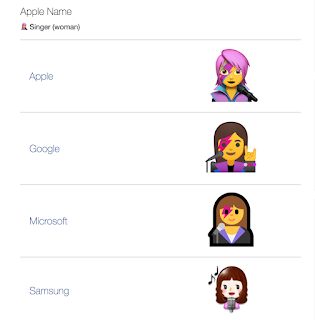 On GetEmoji, you can see the differences in the ways Apple, Google, Samsung and Microsoft all design different emojis for their own brand, not to mention Facebook's weird designs that automatically translate from Emoji as soon as you hit send on your message. This may seem like a nit-pick, but Samsung really missed the mark here. The connotation of that singer looks much more "goody-two-shoes" to a North American audience (in my opinion) while I suppose someone from Asia might think of that as a k-pop or j-pop singer (more badass)? In any case, they're different. And this is only one example. So, when I text people from my iPhone who have an Android phone, I feel apprehensive about using emojis. I never know how they will appear and how my message will be received. Seeing the world through the eyes of a designer can sometimes be a chore. Not to be dramatic or anything, but I can never just sit and enjoy a movie without a million questions about little details running through my head. One of those things is a constant need to analyze all the props created for movies. I don't think people think about this as they watch movies, but feel free to correct me if you do. Long story short, I spent two hours researching the painter who actually created the beautiful paintings (made by the character Sam) in Wes Anderson's Moonrise Kingdom. It's a problem. So who are the people making these props? Take Annie Atkins, for example. She specializes in graphics for filmmaking, including lettering, illustrations and more — she has designed all kinds of graphic props, including “telegrams, vintage cigarette packaging, maps, love letters, books, poems, labeling, passports and fake CIA identification cards.” All of the small design decisions she makes contribute to the creation of a cohesive visual world, establishing a film’s period and place. 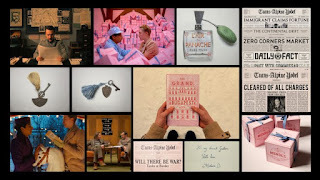 Grand Budapest Hotel, another Anderson instant-classic, contained countless props for Atkins to pore over and create from hotel room keys to books to maps to boxes for tiny little delicate pastries. There's something so magnetic about designing props for another universe. They make the universe seem almost tangible through their own existence, as though they came into creation when the story was written and retain some proof of that universe's tangibility. Basically, they make the story that much more believable and immersive. Not to mention, I love a good eye for detail which Atkins has in spades. Check out her website. Weekly Update 2017-45: Soothing sounds from Wild Nothing, Google's changing navigation elements, and Tiffany's new line of faux trash items (otherwise known as Everyday Objects). Wild Nothing is a pleasant, easy-listening shoegaze piece out of Virginia. I think I first heard of the band on Starbucks radio (surprisingly good for finding interesting indie musicians), and they popped back up on Spotify lately. Sometimes you just need some music to be calm with and drink some tea. This music is definitely that. Check out To Know You, Nocturne and Whenever I.
I started my post on taking stock on the evolution of my Jewish identity, but I realized it's actually a challenging post to tackle, so I've only got an outline done at this point. I'm a little stagnated because I'm not entirely sure where I want to take this learning next, so I realized I'm putting it off a little. More on that soon. On a whim I went to Yorkville last Saturday to check out a visual art exhibit run by OCAD students. I had never been to Yorkville Village (Hazelton Lanes) before, and it was almost as interesting to walk around as the art itself. An art piece made of block sculptures, reminiscent of children's toys. There were some interesting food choices since the mall is somewhat upscale, including Palm Lane (a vegan salad bar by Planta), and a HUGE hot table at Whole Foods. I really tried to restrain myself and ended up spending ~$15 on bulk food (that's how they get you) but it was so extremely good - it was like the type of food that warms your heart. 100% worth it. At the behest of my friend Sasha, he and I entered into a month-long remote hackathon with FriendCanoe, in the hopes of finally getting an MVP to market. I think I've been the blocker since my life has been going crazy lately. Hopefully this will be the motivation we(I) need to keep working on it. This week I'd like to keep working on the Jewish Identity reflection. I'd like to finish it between Thursday evening and Saturday late afternoon, so that I can start thinking about next steps. I'd also like to make time for the hackathon. So some deft scheduling of my month will need to happen this weekend as well. I'm finishing up a user experience audit at work, of a real estate website that is in large need of revamp. Our client agrees, so that's all well and good, but it makes me wonder how their navigation even got to the state it's in now. Among other factors, various elements of the navigation change location, appear or disappear depending on which page the user is on. It may go without saying that general rules of navigation dictate that it should be consistent so that a user can become comfortable in the locations of all elements (for easier access to the information they need). A screenshot of me searching for "apple" and "joe fresh slip on sneaker" on Google. Not only does the navigation order change to better suit what Google thinks I want to know (such as moving "Shopping" to the top of the list when I search for a shoe, but it also flickers quite a bit (note the quick change of navigation order after I search for "apple". The former could be a winning case in that Google updates to help you find what you need, but the flicker is just messy. Its original state appears for long enough that I begin to organize and memorize the order of elements in my mind, just to have it change again. I don't think I can use any of this in my current dilemma, but it's all interesting. They've done it again. Yet another haute couture trend I don't understand. I'm talking about Tiffany, the company with its own shade of greeny-blue and products so popular that you can find any number in a range of knockoffs (you haven't really made it until someone plagiarizes your style). 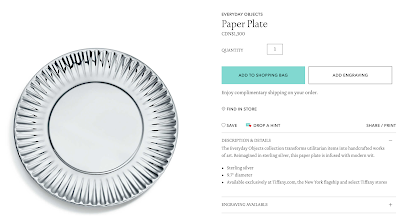 They've just launched a collection of beautiful silver-and-blue items that are all replicas of cheap everyday objects like a paper plate, a crazy straw, a tin can (seriously) and lots more. Of course, the kicker is that these replicas are worth much, much more than their original counterparts, which I find slightly cheeky if nothing else. 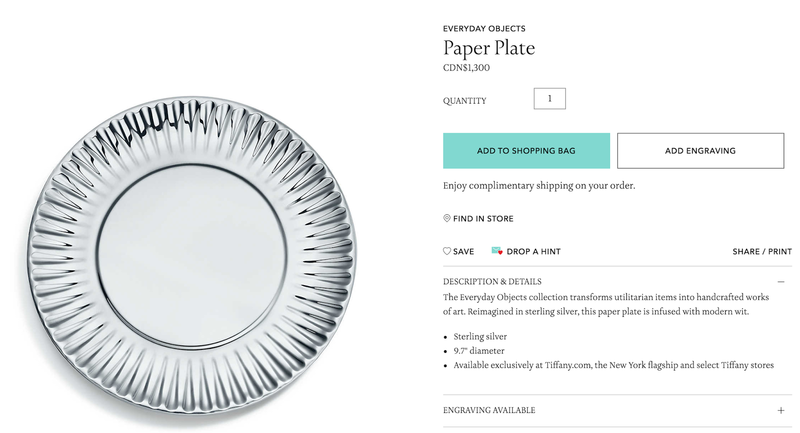 This sterling replica of a paper plate is being sold for the price of 130,000 regular paper plates. After all, this is a website that includes two separate navigational items for "jewelry" and "high jewelry" aka "you can't afford this". 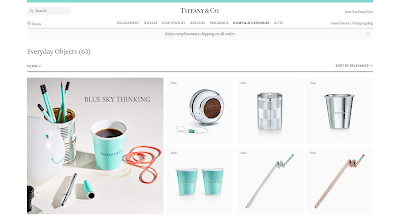 I'm not really sure what to make of this line of items, but it feels as though the rich (or at least Tiffany designers) think that it's a novelty to experience life with the sorts of items a less fortunate person knows well, and not by choice. I can't put my finger on it, but something here feels a bit classist to me.